Highland's cargo bags are great for carrying extra cargo for your next vacation on your roof or in one of the hitch cargo carriers. 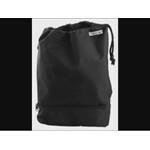 Spacious and weather resistant, these are essential travel accessories. 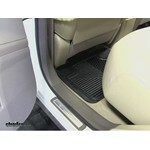 Keep your floors and cargo areas safe from dirt, mud, and everything else with custom fit floor mats. 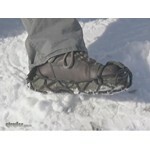 These are made from premium rubber and have a 100-year warranty. To help load your cargo and keep it safe, Highland has a variety of cargo tie-downs and loading ramps. Load everything from your ATV to your Highland cargo bags and you won't have to worry about keeping them safe on the trip. 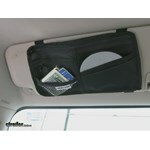 Highland has a variety of vehicle organizers to keep your CDs, sunglasses, phone, and other gear secure and organized while you're driving. 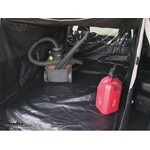 They also have trash keepers to keep your whole vehicle neat and clean. Highland's main focus is on developing products to protect your vehicle from the elements and help you organize your cargo. With this focus in mind, Highland has been producing innovative and useful products for over 50 years. The Highland Cargo Net part # H9500100 would work great for a cargo tray that matches the dimensions you listed of 50 inch by 60 inch. 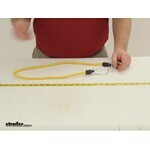 This net is 36 inch by 48 inch unstretched so stretched out the dimensions of your rack it would give a nice snug fit. Yes, the cargo net part # H9500100 that you referenced will work well with the Rola cargo carrier part # 59507 that you mentioned. 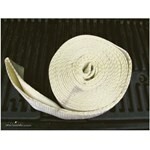 This is the most common cargo net we recommend with that carrier. 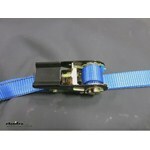 If the Highland Retractable Ratchet Strap, # 1154000, is not long enough to reach across your boat, then we do have a wide variety of 2 inch wide straps that are longer. 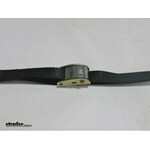 I have listed a few different size straps for you to check out, as well as a link to our ratchet straps. The Highland Floor Mats, part # 46022, for your 2008 Honda Element are made of a pliable, premium rubber that will not stiffen or crack, and will help keep the mats from sliding in your vehicle. They are not a hard rubber or plastic material. The small, anti-skid spikes on the back of the floor mat will also keep the mats from slipping if your Element has the carpet flooring. Yes. 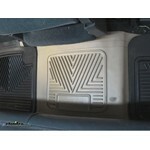 The Highland floor mats # 46042 will fit a 2013 Ford E-350 passenger van. 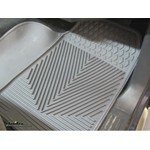 I have also included a link to all of the floor mats, custom, semi-custom, and universal, that will fit your van. 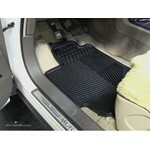 The dimensions of the Auto Floor Mats All Weather - Center Hump Mat, item # 46041, are 33 inches x 16 inches. 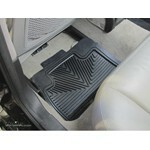 It is a universal floor mat that can be cut down to fit different vehicles. 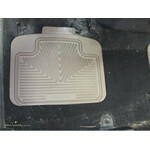 The All Weather Floor Mat, part # 46041, only covers the middle hump between the two front seats. 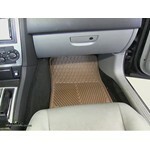 It will not protect the floor of the driver or passenger side. 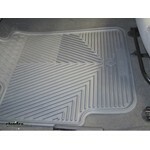 The Highland cargo mat that will fit your 2012 Honda Pilot from behind the second row of seats to the back of the vehicle is the Highland Universal Cargo Mat, part # 46045. 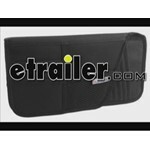 This cargo mat is black and is a universal design mat. 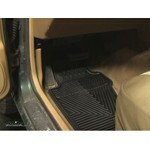 I also have two custom fit cargo mats for your vehicle. 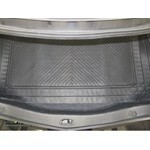 The WeatherTech Cargo Liner, part # WT40378, in black and the Husky WeatherBeater Cargo Liner, part # HL24361, in black. 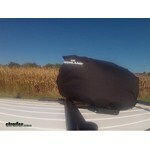 They will also cover from behind the second row of seats to the back of the vehicle. 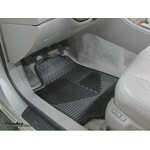 The second row floor mats for your 2012 Ford Edge to match the Highland Floor Mats, part # 46022, is the Highland 2 Piece Floor Mats, part # 46031, or the Highland 3 Piece Floor Mats, part # 46040. 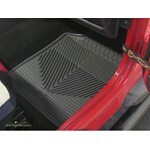 The # 46040 3 piece floor mats can be connected together to give the appearance of a 1 piece design. 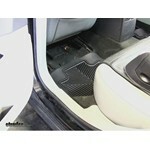 I also have a cargo mat for the 2012 Ford Edge which is the Highland Universal Cargo Mat, part # 46045. All of the mats mentioned above are black. 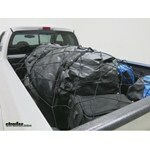 The hooks on the Deluxe Bungee Truck Net 60 x 78, item # 95005, are nearly identical to the hooks on the Master Lock Adjustable Truck Bed Cargo Net, item # 3052DAT. 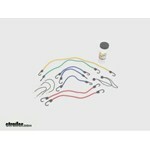 These hooks are plastic J shaped hooks with holes in them so they can be secured with a rope or other tie down if the size needs to be extended. 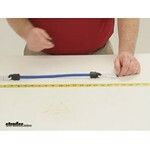 These cargo nets are also the same size at 60 inches by 78 inches. I spoke with my contact at Highland, the manufacturer of Floor Mats, # 46021, and she stated that there is no grommets on the 46021 mats for your 2007 Toyota Yaris. I made a call to my contact at WetherTech to see if their available mats for your Yaris have grommets. She stated that Floor Mats, # WTW116, come with both the hook and the hole for the hook. 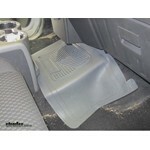 I have a set of WeatherTech mats and they work great and keep my vehicles carpet clean. Yes, the floor mats part # 46042 that you referenced will fit your 2014 Freedom Elite that is built on a Ford cutaway chassis. 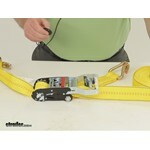 Can Highland Ratchet Straps be Cut? The Highland Semi-Custom Cargo Area Mat you referenced, part # 4401200 measures 54-1/2 inches x 49-1/4 inches and is intended to be trimmed to fit. 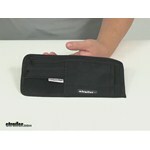 The mat features molded lines on the back that will help you trim it to fit. As long as the floor in the cargo area of your Town and Country measures less than 54-1/2 by 49-1/4, the mat will work just fine for you. 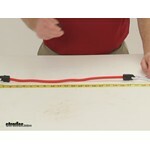 If you would prefer a custom-fit mat, you can see our selection of those by clicking the provided link. Yes. The mat can be trimmed. It is just like the 4501200 only a different color. 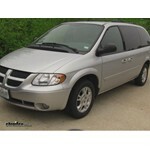 It states it has molded-in trim slots on the back that, when trimmed, will fit the specific vehicle exactly. 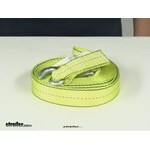 However, it starts out a few inches smaller than the 57 inches wide you are looking for (54-1/2 inches x 49-1/4 inches). I checked with Highland and these are the largest rubber cargo mats available. Good news! 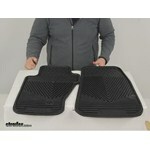 You can purchase rubber front floor mats for your 2015 Ford E-450 right here at etrailer.com. The semi-custom highland rubber all weather mats that will fit your E-450 are available in black # 46042. 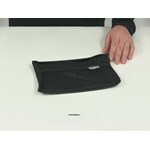 I have linked them to this page for your purchasing convenience. Yes, you can either toss your trash straight into the organizer and empty it from the bottom, or you can use plastic grocery bags like trash can liners. If you are needing a bigger trash holder for the backseat of your vehicle, you can use the Highland Car Trash Keeper # 1932600 which installs on the headrest of the seat in front of it. 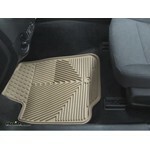 The Highland Auto Floor Mats # 46022 you referenced are made of 100 percent rubber with no carpeting. 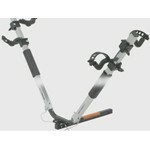 They do not have the eyelets for your 2006 Toyota Tacoma, but have the raised rubber anti-skid spikes on the bottom. 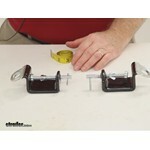 I have included a link to a video review of this product. 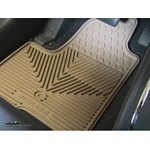 I have also provided a link to all our floor mat options for your Tacoma. You will want to select your cab style prior to examining your choices to ensure you get the right floor mat for your vehicle. 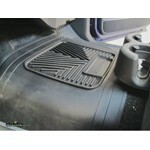 Yes, the Highland Floor Mats part # 46042 that you referenced are a confirmed fit for your 2016 Ford E-350 Gulfstream BT Cruiser Motorhome. 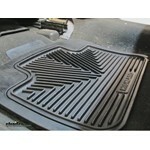 The Highland Floor Mats, # 46030, for your 2002 BMW 3 Series is a 2 piece set that will fit the front drivers side and passenger side. The Highland Auto Floor Mats All Weather - Black # 46042 referenced in your question are confirmed to fit the 2016 Ford E-450 base chassis. Please keep in mind that some RV manufacturers add internal consoles and other non-Ford interior items that may prevent a perfect fit. 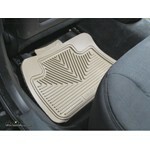 These are premium rubber floor mats that feature deep and sculpted ridges to help to trap water, mud and other debris.